Sunday 24th February is the Day! That's right. Sunday 24th is the day of the Pakuranga Carnival. A day for our community and their Families. The venue is the same as usual - Bramley Reserve. This is an important fund raiser for our Club. To ensure the day' success, we will need your assistance. There will be jobs for everyone - some for setup; some for operations throughout the day; some for cleanup. Don Lawry will be allocating areas to individuals for a letter box drop the week prior to the event. Chris Ward will have the staff roster for the day allocating jobs and times. In addition to last years activities, there will be the Howick Brass Band and NZ Police & their Patrol Jet Ski. 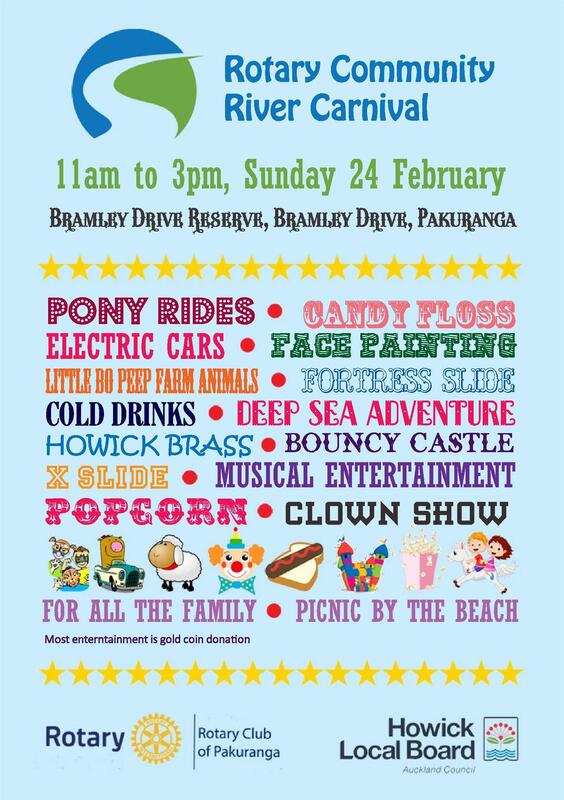 Bring your family - bring everybody's family to the Carnival Day on Sunday 24th at Bramley Reserve. Remember, from the Club's perspective, the most important person to bring is YOU - YOUR CLUB NEEDS YOU!